Well before I went to school, my first teacher was my mom and my first classroom was the kitchen. My mom would teach my siblings and me our colors, numbers, alphabet, shapes and sizes all using food and things around the kitchen. Our field trips were often to the grocery stores where she'd point out fruits, vegetables, meats and other foods, usually telling us how they're grown, where they're grown and where they came from. Rarely did we ever venture down the grocery aisles of pre-packaged or convenience foods since those items never founds its way into our cart. And after those fond grocery trips, we'd all go home, help put away the groceries and mom would work on snacks for us. One of those snacks I remember so well was Platanos Maduros, which are fried sweet plantains. It's commonly known as a Cuban dish, but other cultures certainly enjoy preparing ripe plantains in a similar way. I made this dish as part of the recent Cuban/Latin inspired dinner for my sister and her family. My sister and I reminisced about our childhood days when Mom would call us to the table when the Platanos Maduros were ready. 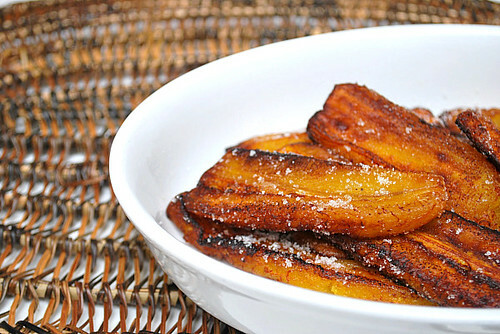 It's such a simple dish of sweet ripe plantains that are fried in some oil, then sprinkled with sugar while hot. The key to preparing this is using completely ripe plantains, where the skin is almost completely black. The blacker the plantain, the sweeter it is, just as you'd imagine regular bananas to be. You can choose to sprinkle these plantains with either white or brown sugar after they've been fried... and some even prefer rolling the plantain slices in sugar before frying for a more caramelized flavor. Cut ends from plantains and peel fruit. Diagonally cut plantains into 1/2-inch-thick slices. In a large nonstick skillet heat 1/3 cup oil over moderately high heat until hot but not smoking and sauté plantains in batches, without crowding, until golden brown, 1 to 2 minutes on each side, adding more oil to skillet as necessary. With a spatula transfer plantains as sautéed to paper towels to drain. Sprinkle with sugar and serve plantains immediately. I've never tried plátanos (accent on the "a") maduros because I am not crazy about bananas, but after seeing your photo and recipe, I may have to change that. well, I grew up eating these Platanos maduros (with accent on the @ as Memoria said). Thank you so much for posting this recipe! I loved Platanos maduros as a college student studying in Central America. Years later platanos are finally available in my grocery store! None of the Dutchies here even know that they are! Thank you!